Ethics 4 A Digital World: What the Scrap is Digital Citizenship? What the Scrap is Digital Citizenship? A new school year has begun, and the very best parts of my job are back in the classroom with me on a regular basis. As a technology specialist, I spend my time with kids in grades 3 through 9 teaching technical skills, finding great ways to incorporate technology into curricular projects, and best of all, really getting to spend time talking to kids about what it means to participate in our digital world. Though it's quite easy nowadays to do a quick Google search and find millions of results for this term to help us grasp the concept, creating authentic experiences for our students (or your kids) to actually practice digital citizenship is essential for true understanding to take place. Horror stories abound depicting all the negative consequences of unchecked social media, including cyberbullying, sexting, hate speech, ruined reputations, poor decision-making and the like. Far too often we read stories of adults who have relinquished their responsibility in this realm by writing technology off as something "they don't get." Well, Sam and I can tell you that the more we work with kids and digital tools, the more we talk to them about behavior. You don't have to "get it" to talk to your kids about the kind of people they are growing up to be. Behavior isn't really about technology at all...it's about the choices we make. Technology just gives us more opportunities to make choices, and sometimes, unfortunately, those choices have bigger consequences because they create a digital trail. So how do we talk to kids about this in a way that makes sense to them? I've learned, sometimes the hard way, that talking isn't enough. Kids need PRACTICE. But they also need language that they can understand and remember. With my youngest students, I explain to them that technology vocabulary is like learning a new language. Words that mean something in our daily usage of English have a different meaning when it comes to computers. Take the word "menu," for example. When I ask them to find a particular menu, I'm not asking them to order me an entrée, amirite? If we need to find something in the dock, I'm not talking about a place you tie up boats. 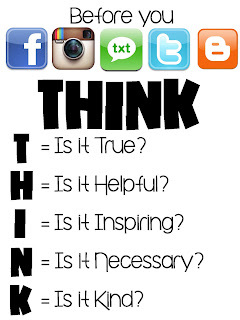 Last year, when we solicited advice for youngsters from our 8th graders, many groups responded with something like, "Think before you post online." GREAT advice, right? But what does that actually mean? Think about what? How do I stop and think about the future impact of my decisions when I'm not developmentally able or ready to do that? Looking for help, I found this great infographic from a generous and sharing educator. Breaking down what it means to "think" into smaller elements, and a series of questions that kids could easily understand and answer, helped them get it. And this year? They've seen the posters and read the words, and when I ask them what Digital Citizenship is, they say, "THINK!" 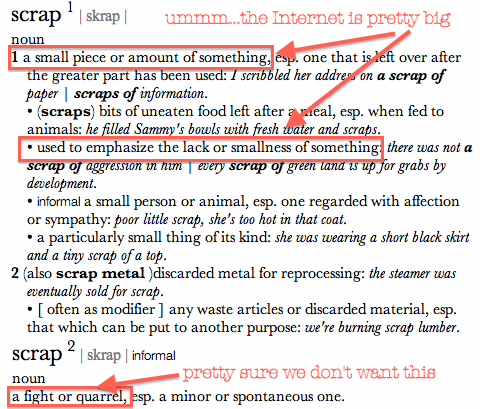 Of course, I still need to figure out some brilliant metaphor for SCRAP in the digital world. The definition doesn't easily lend itself to my cause. If you have an idea, please share! But for now, we're going with it. Kids tend to remember safe and responsible pretty easily, but we need to really dig into critical and productive to find all the great ways we can use technology for our own learning and to make the world a better place. If SCRAP helps, so be it.